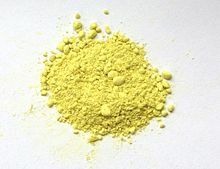 Aloin is a bitter, lemon-yellow-colored compound isolated from the aloe plant. It is used as a stimulant-laxative, treating constipation by inducing bowel movements. The compound is present in the yellow aloe latex that exudes from under the surface of the plant's leaves.